A 3-in-1 night serum that resurfaces, hydrates and clarifies dull skin while you sleep, formulated with a 14% AHA/BHA/gentle flower acids blend. Hyaluronic acid and our proprietary honey blend deliver intense hydration. Salicylic acid derived from willow bark helps minimize the appearance of pores. Honeymoon Glow also helps reduce the look of fine lines and wrinkles to reveal a healthy, more youthful complexion and a natural glow—no wedding required. Resurfaces dull skin. A blend of AHA from lactic, glycolic, citric and fruit acids exfoliates dead skin cells, promotes cell renewal, targets hyperpigmentation and helps reduce the appearance of fine lines and wrinkles. Refines pores.BHA from willow bark, a natural source of salicylic acid, helps visibly diminish pore size. Gently exfoliates. Flower acids from hibiscus extract help exfoliate and clarify skin. Perfect for all skin types. Hyaluronic acid, along with our proprietary honey blend, deliver intense yet gentle hydration to ensure skin is never dry or over-stripped. Apply a generous layer (1–2 pumps) to clean skin at night, avoiding eyes and lips. Use 2–3 times a week. May build up to more frequent use. Slight tingling may be experienced. 10% AHA Blend: Lactic, glycolic, citric and fruit acids exfoliate dead skin cells, promote cell renewal, target hyperpigmentation and help reduce the appearance of pores, fine lines, and wrinkles. 1% BHA: Natural salicylic acid from willow bark helps reduce the appearance of pores. 3% Flower Acids Blend: Hibiscus flower extract gently exfoliates while moisturizing skin. Hyaluronic Acid: Hydrates and plumps by drawing water to the skin and helping to prevent moisture loss. Proprietary Honey Blend: Known for its soothing and humectant properties, this special honey provides skin-loving moisture and nourishment, plus antioxidants. I already finished one bottle and I had to buy a new one because it's soooo good! Before using the Honeymoon Glow, my skin was very textured and had a lot of scarring from previous acne breakouts. After using this serum for about a month, I noticed my skin was a lot smoother and more radiant. The dark spots on my face have faded a bit and the "craters" I had on my cheeks are slowly starting to disappear. 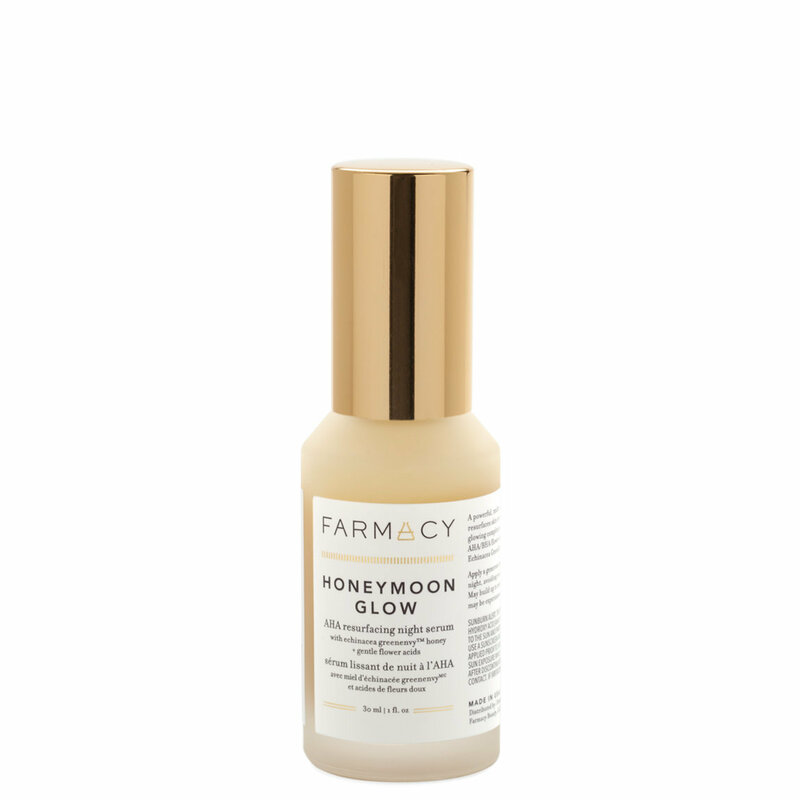 I use the Honeymoon Glow 3-4 times a week and follow with the Farmacy Sleep Tight night balm for extra hydration. I really love this product and the entire Farmacy line! I have been using this serum for 3 weeks and I definitely seeing results now, especially in my skin texture around my nose where I have some larger pores. I'm so happy I got it, I can't wait to see how my skin looks by the end of the bottle! I definitely feel the tingling when I apply it, and although it's not uncomfortable for me I probably wouldn't recommend it for anyone who's super sensitive. The texture is creamy and it glides on nicely and absorbs fast. One pump is plenty to cover my whole face. On nights when I use this serum I don't follow it with anything else, it feels hydrating enough on its own for me. I saw Farmacy recommend to use an oil-based product for additional moisture if you need it, like the Sleep Tight, because water-based products can make the acids less effective, so I'm careful not to apply anything water-based afterwards. Honeymoon Glow has totally replaced my other AHA masks because it's so easy to apply and not have to rinse off, and I'm loving the results! I love Farmacy's sunscreen so I thought I would give this a try and bought it on a whim. I love it. It feels like a nighttime version of Sunday Riley's Good Genes. The acids give it a bit of zing and I feel like it really is doing something. Nice alternative to those nights when you are not using retinol but still want an active ingredient. The price point is spot on. So far I am loving this product. I have only been using it for 1 week but so far so good. I do not experience any intense tingling or burning. It's very minimal in my opinion. I use it 3 times a week like suggested on the bottle every 2 days I will increase my usage as time goes. I will update this once I finish the bottle. The first night I used this I woke up amazed.My skin felt so soft and my pores were less noticeable. I woke up durning the night night and told my husband something is burning. It smelled like burning wood so I thought something was on fire. Then I realized it was the product. It is not an unpleasant odor just caught me off guard. The scent does go away very quickly. I wil buy this again. Wake up to soft, smooth skin! I was pleasantly surprised by this serum: it's super rich and goes on like a moisturizer with the most delicious honey scent, but it's got the zing of a pretty strong exfoliating treatment and left my skin feeling soft and dewy. I love how this formula feels on my face and I love the glowy and smooth results I wake up to in the morning. Can't wait to see the results after more use! I really like this serum. It left my skin silky smooth, and didn’t make me breakout, which was a plus. Also it smells great. I use it 3 times a week and follow with the Farmacy Sleep Tight night balm for extra hydration. I actually really love the entire Farmacy line! I am almost done with my 1st bottle and I use this every other night. I love how it feels, smells and the packaging is beautiful but I have not gotten any fading of dark spots. I have one on my cheek and it has not faded one bit. Now this is a dark spots from a blemish that was under the skin and I kind picked at it. So maybe that is why. No I've tried reaching out to Farmacy to ask but have never gotten a response.